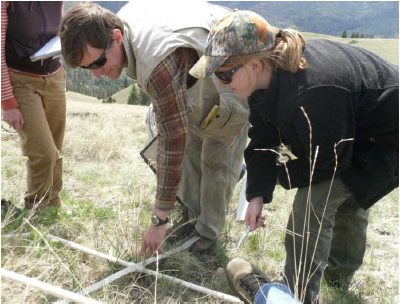 Montana Fish, Wildlife, and Parks and the University of Montana are now in the second year of a three-year project investigating the influence of predation, habitat, and nutrition on elk population dynamics. As we approach the end of the second summer of intensive calf survival monitoring, we continue to see lion predation as the dominant cause of calf mortality, and find overall calf survival rates and mortality causes are similar to data collected during summer 2011. Heading into the fall, we will continue to monitor both adult and calf survival and movements, and we hope to initiate a new component of the project focusing on estimating lion density within the study area. Elk Calf Survival The second year of the elk calf survival study is underway. From May 29 – June 8, 2012, over 50 project staff and volunteers participated in searching for and capturing newborn calves. The capture was a huge success thanks to the efforts of the capture teams. In addition to capturing calves in the East Fork and West Fork areas of the Bitterroot, this year we also captured calves in the Upper Big Hole Valley. Prior to the start of the calf capture, many of the radiocollared adult female elk migrated to the Big Hole, so we expanded our capture efforts into that area in efforts to mark calves from within the entire East Fork elk herd calving range. 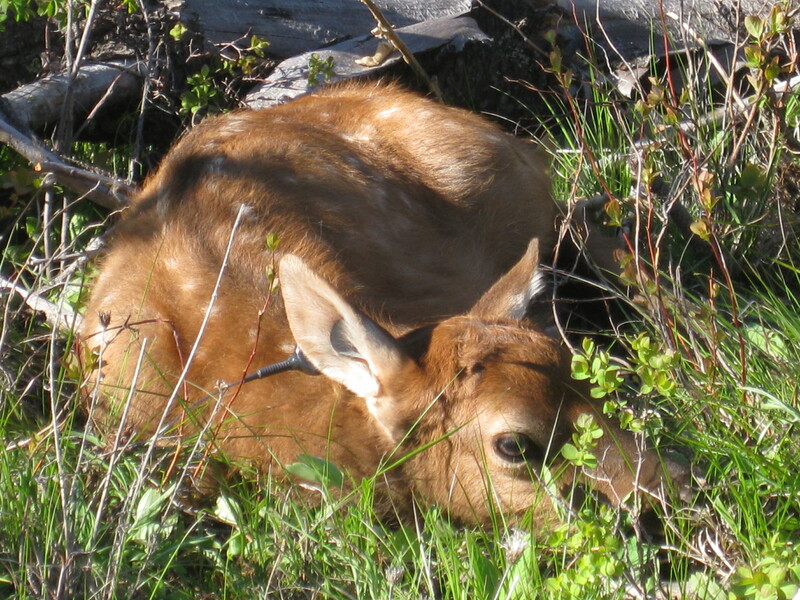 We captured a total of 76 elk calves, 23 in the upper West Fork area and 53 in the East Fork and Big Hole areas. Seventy-one calves were marked with VHF ear tags, and we tested 5 expandable radiocollars on the other calves. These collars are designed to expand as the calf grows and ultimately break away after approximately 12 months. Collars use the same VHF technology as the ear tags for tracking and monitoring elk calf survival. Since capture, we have been monitoring calves daily. Four of the five expandable collars detached and dropped off shortly after capture, and 16 ear tags have failed. One additional ear tag has not yet been retrieved. Due to problems with ear tag retention last year, we employed a modified ear tag design that fit the ear better. Despite initial success with tags properly staying affixed to calf ears, some new tags showed evidence of a weak design and the plastic piece holding the VHF beacon to the ear tag cracked. The new ear tag malfunction has been a setback, and we have been working closely with several radiotelemetry vendors to remedy the situation for future calf tagging. Of the 55 known-fate calves, 35 are alive and 20 are dead. Field staff have monitored calves daily throughout the summer and collected detailed mortality investigations at each mortality event. Similar to last summer, lion predation continues to be the predominant source of calf mortality. Of the 20 documented mortalities, mortality sources include lion predation (n = 6), black bear predation (n = 4), wolf predation (n = 1), unknown predator (n = 3), natural-non predation causes (n = 2), and unknown causes (n =4). The natural, non-predation related mortality causes included one calf that was abandoned and died of malnutrition and one calf that died in a fence. In addition to trying to understand the effects of carnivores on calf survival and elk population dynamics, this project aims to also understand the changes in forage and habitat, and how these affect elk condition and survival. Our first objective is to understand differences in forest stand age (forestry and fire), forage biomass, and seasonal phenology of forage productivity between the West Fork and East Fork elk summer ranges. Building on this descriptive and comparative understanding of forage and habitat differences between West Fork and East Fork summer ranges, our second objective will be to understand elk resource selection for forage classes, and ultimately test for the consequences of these differences in forage and habitat on elk nutritional condition between elk populations, as reported on in previous updates. The ability to link adult female resource selection for forage classes to variation in adult female body condition, pregnancy rates, calf birth weights and calf survival will allow us to provide specific recommendations for habitat management treatments that will directly benefit elk populations. 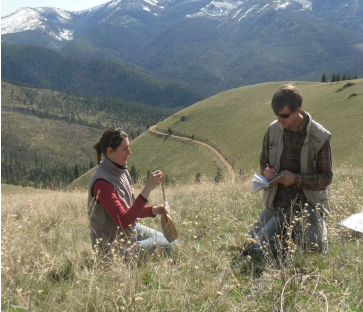 During summer 2012, we initiated vegetation sampling across the study area to understand forage biomass across habitat types from an elk nutritional ecology perspective. A two person field team measured biomass of key forage plant species during the peak of the growing season. Sampling was stratified across habitat classes (i.e. recently burned coniferous forest, mature coniferous forest, grassland, etc.). However, forage ‘quality’ is much more than just peak forage biomass, and instead reflects the dynamics of the growing season phenology. To measure phenology, we are using satellite remote sensed vegetation productivity data to understand comparative differences in growing season dynamics between the West Fork and East Fork areas, and also identify changes within the two units over the past 20 years. We will then combine predictions from field vegetation sampling with remotely-sensed measures of vegetation productivity during our study to quantitatively test for differences in habitat types, elk forage biomass and habitat, and growing season dynamics differences between the West Fork and East Fork area elk summer ranges. We are working in collaboration with the U. S. Forest Service and funding from the National Aeronautics and Space Administration (NASA) on these efforts. 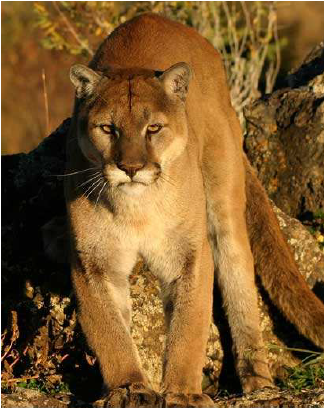 We are currently working to develop research aimed at estimating mountain lion population density in the study area. The purpose of the winter 2012-2013 mountain lion research would be to collect a baseline estimate of mountain lion density in HD 250 and HD 270 before we expect major changes in mountain lion populations to occur because of recent lion harvest changes. Concurrent with this effort, we will continue to monitor elk calf survival rates throughout the winter 2012/2013, and for the following year in 2013/2014. One of the uncertainties in whether changes in lion harvest will manifest in changes in elk calf recruitment and elk population growth is the ability of harvest changes to affect biologically significant reductions in mountain lion density because of immigration from adjacent areas of Idaho and Montana. Our long-term goal is to return to HD 250 and HD 270 several years after the liberalized mountain lion regulations are implemented and again estimate mountain lion density to evaluate the extent to which lion harvest and density is controlled by wildlife management prescriptions in the southern Bitterroot Valley. In order to successfully achieve this long-term goal, we must know where we started and obtain the baseline mountain lion estimates this winter in 2012/2013. 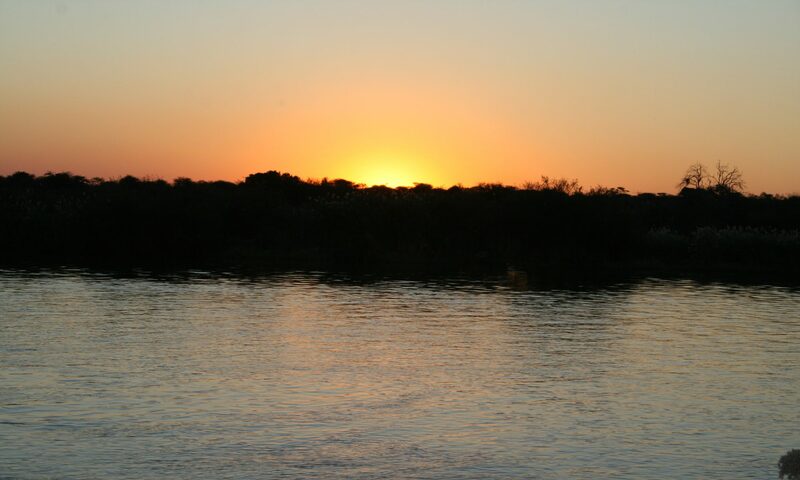 We are currently fundraising to make this portion of the project possible. During the winter 2012-2013, we will conduct our third and final year of adult female elk captures, and deploy GPS radiocollars. Additionally, we will capture and radiotag 20 6-month-old calves in early winter in efforts to increase the sample of marked calves going into the over-winter survival monitoring period. Goodbye’s and Acknowledgements This fall, Craig Jourdonnais, the FWP Bitterroot biologist will be retiring. Craig was the driving force in initiating this project and has been instrumental in making all aspects of this project success. We would like to say a special thank you to Craig for all of his efforts and hard work towards making this project a success. Additionally, we thank the landowners that have allowed access for fieldwork and provided logistical support, and the organizations and individuals that have provided financial support for this project : Ravalli County Fish and Wildlife Association, Montana Bowhunters Association, Hellgate Hunters and Anglers, Rocky Mountain Elk Foundation, Safari Club International Foundation, Western Montana Chapter of the Safari Club, the Shikar-Safari Club International Foundation, Montana Mapping & GPS, McIntire-Stennis Foundation (USDA), Pope and Young Foundation, the Bitterroot and Beaverhead-Deerlodge Resource Advisory Councils, NASA, the U. S. Forest Service, the MPG Ranch, and private donations from individuals in the community. Funding was also provided by revenues from the sale of Montana hunting and fishing licenses and matching Federal Aid in Wildlife Restoration grants to Montana Fish, Wildlife, and Parks.